This dissertation investigates the phonetic realization and phonological behaviour of the class of retroflexes, i.e. sounds that are articulated with the tongue tip or the underside of the tongue tip against the postalveolar or palatal region. On the basis of four articulatory properties, a new definition of retroflexes is proposed. These properties are apicality, posteriority, sublingual cavity, and retraction; the latter is shown to imply that retroflexes are incompatible with secondary palatalization. The phonetic section gives an overview of the factors responsible for the large articulatory variation of retroflexes and discusses putative counterexamples of palatalized retroflexes. In addition, it describes the acoustic realization of retroflexes and proposes the common characteristic of a low third fomant. 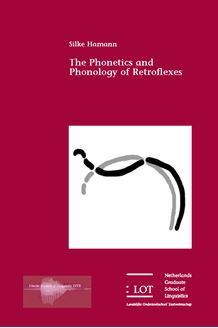 The phonological section discusses processes involving retroflexes from a large number of typologically diverse languages. These processes are shown to be grounded in the similar articulatory and acoustic properties of the retroflex class. Furthermore, this section gives a phonological analysis of the processes involving retroflexes in an Optimality Theoretic framework with underlying perceptual representations, based on Boersma’s Functional Phonology. Evidence is presented for the non-universality of the retroflex class, and for the non-necessity of innate phonological features. This study is of interest to phonologists and phoneticians, especially to those working on the phonetics-phonology interface.